Energy efficient homes are all the rave right now. What kind of features can contribute to your home saving on energy usage? Just about everyone these days is on board with the energy efficiency craze. Whether you’re just trying to save a pretty penny on your utility bills or you’re heavily invested in environmentalism, there are plenty of good reasons to build a home with energy efficiency in mind. Besides, those energy savings really begin to add up over the years and more than justify the initial costs of opting for energy efficient features in your home. With that said, we’re happy to present our top five energy efficient features that you may want to consider in your home design. These days, there are a whole host of energy efficient wall systems. One of these is spray-in foam insulation, which provides a high R-value per inch of foam while also sealing the entire wall from air leakage. Our standard Blown-In-Blanket system is a cost effective way to achieve a high R-value without sticker shock. Energy efficient windows are a necessity in keeping your home warm or cool without breaking the bank. The right windows have a U-Factor as well as low emissivity that is suitable for your climate and the direction of the window. 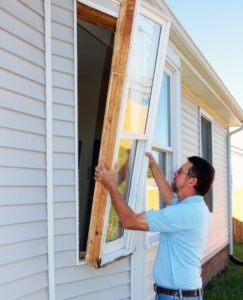 Your windows must also be sealed properly, which can equally impact your monthly utility bills. Using LEDs in homes has become more commonplace, especially for utility lighting like the kinds of lights you may see installed in above counter cabinetry. LED lighting can vary a lot in quality and some forms of LED lighting aren’t suitable for home use because they just aren’t bright enough, but as a technology, its come a long way. The good news is virtually all fixtures work with LEDs so it just comes down to finding the right bulbs for you, which will end up saving you hundreds of dollars and can last a decade or more before needing to be replaced. Your refrigerator, washer, and dishwasher can all be energy efficient. Look for appliances that are Energy Star certified and over the course of your lifetime, those appliances will end up saving you some money in comparison to their energy-inefficient counterparts. Take control of your utilities by installing solar panels on your home. Not only can solar panels make you much more energy efficient, but they also reduce your reliance on the grid and can make you feel like a much more independent homeowner. When properly installed, you can expect big savings on your energy bill with solar panels as well. Here at Accessible Home Builders, we’re proud to say we’ve been building and remodeling homes since 1994. In that time, we’ve serviced the areas of Rehoboth Beach, Lewes, Selbyville, Seaford, Millsboro, Georgetown, Laurel, and more communities within Delaware. We work to guarantee a high level of professionalism, dedication, and the use of quality materials to ensure our customers have the home they deserve. To get in touch with us, give us a call at our office at 302-663-0464, send us an email at info@accessiblehomebuilders.com or visit us in person at 28412 DuPont Blvd, #103 Millsboro, DE 19966. Alternatively, give our satellite office a call at 302-628-9571 which is located at 500 W. Stein Hwy. Seaford, DE 19973. Be sure to follow us on Facebook, Twitter, LinkedIn, Google+, and YouTube to stay updated on what we’re up to! This entry was posted on Friday, January 25th, 2019 at 4:06 pm. Both comments and pings are currently closed.